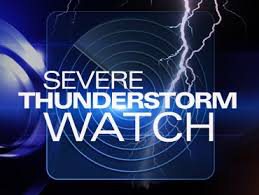 Severe Thunderstorm Watch Issued for June 12! Severe thunderstorm conditions possible - afternoon to evening. Conditions are favourable for the development of severe thunderstorms that may be capable of producing heavy rain. A slow moving Upper Low will track into Washington State later this afternoon. Thunderstorms are expected to develop this afternoon in the South West BC Interior. The main threat with these storms will be heavy downpours with rainfall amounts of up to 15mm per hour. Fast moving water across a road can sweep a vehicle away. Hail and strong wind gusts are also possible. Intense lightning is likely with any storm that develops. Be prepared for severe weather. Take cover immediately, if threatening weather approaches. In Canada, lightning kills up to 10 people every year. Remember, when thunder roars, go indoors. Environment Canada meteorologists will update alerts as required. Please monitor local media or Weatheradio. Email reports of severe weather to pacificstorm@ec.gc.ca or tweet with the hashtag #BCStorm.